The previous collection of quotes became so large that it was too unwieldy for the single post I’d been using, necessitating the creation of this dedicated thread. The quotes will be collected, on an ongoing basis, in the first two (or three, if necessary) posts in this thread. Most of these quotes were collected when people posted reports/interviews right here in this very forum, so please feel free to post any relevant material in this thread so that it can be added to the collection. Nevins promised that he and Lynch won’t discuss the future of Twin Peaks until the show’s finale, scheduled for Labor Day weekend. He also noted that “Lynch has been in France pretty much since the premiere event we had,” so he hasn’t been available for discussion. Nevins would support alternate cuts and extra footage, but doubts Lynch would be into it. “It was always intended to be one season.” He added, ”A lot of people are speculating but there’s been zero contemplation, zero discussions other than fans asking me about it.” Showtime programming president Gary Levine adds that taking on all 18 hours of the revived mystery was a “Herculean effort“ for director David Lynch, but should Lynch decide he wants to climb the mountain of premium television content once more, Showtime is very much open to the idea. “I don’t know if he wants to do it,” though, Levine adds. As to whether the miniseries would become an ongoing series, Frost said: "If we have a great time doing it and everybody loves it and they decide there's room for more, I could see it going that way." Q: Is this limited series meant to offer a sense of finality at the end, or is it another prism through which you can view the series as a whole? "I'd hate to prejudge for people what their perceptions should be, or even to direct them. I always like, as you know, the work to speak for itself. It's too early really to answer this question, I guess is a long-winded way of saying that. We'll let people tell us what they think, and how they feel, and we'll go from there." Q: If it’s a success, could there be more? "We’ve learned never to say never. Anything is a possibility." Q: Is the limited series definitely the end of the Twin Peaks franchise or you would be open for more? "That’s sort of what we thought the last time, and look what happened. I wouldn’t think it will take us 25 years to decide the next time around — I hope it wouldn’t because it would be a lot harder to do the work then — but I think anything’s possible to be honest, given that this is happening." 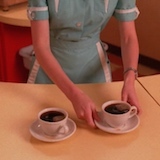 Q: Are we talking about a circle now that you feel is fully completed with Twin Peaks? "Well, I think if this was all we ended up doing, I’d say yeah, I think the line came all the way around and met the point where we started." Q: So this is a place of peace for you? "It is today. (laughing) You know, you never know what tomorrow will bring. Whatever happens from this point forward I feel very satisfied with what we were able to do." “It's too early to say about any possible future of the show from here on out." Q; Answering questions closes off certain stories should there be a Season 4. That power was solely in your hands – was that in your mind at all when writing? "No, I wouldn't say that anything is foreclosed in terms of moving forward." 25YL: The Final Dossier is unique in the fact that it could be either a satisfying conclusion or a hint of what’s to come in either a future book or continuation of the series. Was that the desired effect? Frost: Yes, that felt like the right tone to strike with it. If you would have asked me 20 years ago, I would have said that the chances of going back to Twin Peaks one day are remote. Things change, so you never know. It seems to make the most sense to leave things the way they are with life, which is that life goes on. Q: Are you doing another season? His latest Twin Peaks book title may include the word “final,” but Frost hopes the show will continue. Lynch, for his part, politely declined an interview for this story, explaining via a representative that he had moved on from Twin Peaks and was focused on his painting. Q: Do you see yourself making features for television now? "No. I don't know what will happen next, but this is an 18-hour film in my mind. And I love the idea of a continuing story. A feature is over in two-and-a-half, three hours. The stories that you tell on cable can go on and on and on. It's really beautiful." Q: Will there be more Twin Peaks after this? "I have no idea. It depends on how it goes over. You're going to have to wait and see." Could there be more episodes? "You never say never." Lynch will co-write and direct all 18 episodes of Twin Peaks’ new season but won’t disclose whether or not his contract extends beyond the one season. In support of his “Small Stories” photo exhibition currently on display at the Belgrade Culture Centre (Kulturni Centar Beograda) in Serbia, David Lynch participated in a public Skype session projected onto the cinema screen of KCB’s jam-packed theater. "That is too early to tell. If there was a fourth season, it wouldn’t happen for several years, ‘cause it took four and a half years to do this one." EW: How does it feel now to be able to finish what had been an unfinished work? LYNCH: It feels really good. It went really good in the world. I feel very thankful and happy that we did it. EW: Has Showtime talked to you about more Twin Peaks? LYNCH: No, we haven’t talked. The thing just finished! Even if there was more, it would be four years from now before anyone would see it. We’ll just have to wait and see. EW: Do you have any ideas for what would be next? LYNCH: No, I can’t talk about that. Q: What would be the impetus that would require you and Mark Frost to come back to this world? What would it take? Q: But it's definitely not something that you rule out? Q: Going back to the feelings you're having about TV, have you started thinking in terms of long-form storytelling more often in your mind? "Yeah, it's thrilling to me. Continuing story. It's absolutely thrilling." Q: And do you think that TV is generally ready for the kind of stories you want to tell, or was Showtime a special case? "No, I think they're generally ready. And I think it's what's happening. All these things go in waves. But right now, it's a very friendly environment for a continuing story." Q: Does that make you want to dive in aggressively? Does it make you want to go, I want to catch this wave while it's still cresting? Q: And in other ways? When asked by moderator (and self-confessed super fan) Andy Greenwald if he knew this [part 18, specifically] was the ending and if he was writing toward this ending, Lynch replied quickly. How do you feel now that it’s behind you? Is it something you feel like you’ll continue? I don’t talk about that. Lynch: I have no idea. Lynch: I’d say, it’s calling, but the signal has a lot of disturbances. Q: Are you thinking about any film or TV ideas? Lynch: Not right now. I’ve got these boxes of ideas and I’m starting to go through them to see if there’s any gold. I could go into film or TV again but Twin Peaks [The Return] took almost five years with the writing and preproduction, shooting, post-. I would want to do another series but it’d involve finding the time. So we’ll see. Last edited by Jasper on Sat Aug 18, 2018 2:20 pm, edited 18 times in total. Q: I was wondering if YOU personally think David will make another film (Twin Peaks or not)? Q: Personally, would you feel satisfied if The Return was the last glimpse we get into the world of Twin Peaks? Sabrina: I definitely feel that it ended well. It has room for interpretation, and there’s more story, for me. So I like how it ended up, but I would absolutely love to have another season. Absolutely. But if it ends here, I’m totally satiated and feel like it was an experience, and a one-of-a-kind experience that’s so unique you can’t put your finger on it. And I think years from now, if there isn’t anything more, you can still go back to this and say, “wow, that’s a pretty incredible series”. Q: Would you do it again, down the road? "Oh, yes. In a minute." Q: Has he talked about a fourth season with you? Q: Would you be down for it? Q: How long before you can tell us about season 4? Kyle: Yeah. (laughing) I’ll be around. I won’t be moving quite as quickly. Deadline: Do you think you’ll ever return as Agent Cooper? David won’t be drawn on it, but even if it turns out that Laura Palmer is now laid to rest, the world of Blue Rose can continue. Would you come back to it again? Kyle: I think those kinds of things are certainly possible. I think we’re all just waiting on David to have the spark of an idea to go forward. It’d be a great journey. I would drop everything to do that. So will he and Lynch get together again for another series of adventures for Agent Cooper and his various doppelgängers? “I have no sense of that at all,” MacLachlan said. Q: If David Lynch wanted to do another season of Twin Peaks, would you do it? Q: Again, thank you for taking the time to speak with me, do you have any parting words for our readers? Struycken: Let’s lobby hard for another season of Twin Peaks! "I know that there’s some thought about a fourth season, and I know that the parties responsible are thinking on that, and so I think it’s always a possibility." Last edited by Jasper on Mon Oct 29, 2018 11:18 pm, edited 13 times in total. This post is reserved in case of overflow. Adding this one from Kyle after Mr. Strawberry posted a link to the interview in another thread. Jasper wrote: Adding this one from Kyle after Mr. Strawberry posted a link to the interview in another thread. Thats a huge flag that says, "We are into writing a new Season but Dear Kyle you can only know about it once we finish writing it". "Won't say anything" implies that there is something to say. I get the feeling MacLachlan already knows. Thanks to krishnanspace for posting this one. Lynch: I'd say, it’s calling, but the signal has a lot of disturbances. Thanks to Poiuyt for posting this in another thread. I hadn’t gotten around to reading this interview, but I recommend it. "I would want to do another series but it’d involve finding the time." I'm not entirely sure what DKL means by "series". Does this mean that he'd want to do a new, non-Peaks episodic project, or does it mean that he'd want to do another series (meaning a sequential set of episodes or "parts") that may or may not be Twin Peaks? In some English-speaking countries the term "series" is used in the same way that "season" is used in the U.S. Considering that this is the man who gave us "parts" instead of episodes, and continues to refer to the recent Twin Peaks project as a film, I'm not going to jump to any conclusions about this statement. Jasper wrote: Thanks to Poiuyt for posting this in another thread. I hadn’t gotten around to reading this interview, but I recommend it. For me, Lynch is refering to more episodes of Twin Peaks and more after say that a history is calling he of twin Peaks. ( carrie page). I think the important thing is that he's thinking in terms of series...meaning that whether its Peaks or not, he's actually into the idea of getting back into it all again as opposed to either having no ideas or simply wanting to paint or build a table. When he says series I think he means series, for sure. A long form thing. LateReg wrote: I think the important thing is that he's thinking in terms of series...meaning that whether its Peaks or not, he's actually into the idea of getting back into it all again as opposed to either having no ideas or simply wanting to paint or build a table. When he says series I think he means series, for sure. A long form thing. Right, the one reliable thing that we can take from this is that he's still very much considering working on long form episodic material, and that if it were to happen, it would presumably be in the medium of television. SORRY, THESE AREN'T NEW QUOTES. I'm adding a couple of things from interviews that I just read yesterday, even though one is from May and one is from last November. MH: Again, thank you for taking the time to speak with me, do you have any parting words for our readers? I'd missed that Mark Frost one, thanks. That is really reassuring to me for some reason. I had a really strong sense that there was a deliberate attempt to pause the story, rather than conclude it, and it's great to have that confirmed. I think they'd do the same thing even if we got another series. I'm adding a couple of things. One is Sabrina Sutherland saying she'd like more, and the other comes from a Vanity Fair article/interview where they say that Mark Frost would like there to be more without providing an actual quote. Jerry pointed out that Mark Frost tweeted the article, so I'm taking that as a confirmation that the sentiment is legitimate. It's the first time I'm adding something that isn't a direct quote. Krishnanspace posted a link to this short interview in another thread.